Prevailing thought among most hexayurt builders is that the best panels for yurt building are called RMAX, made by an insulation manufacturer also called RMAX. 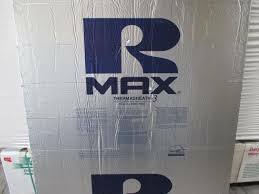 Since RMAX makes a number of different insulation products, perhaps a little more specificity is called for in the discussion. The RMAX product you need is Polyiso, a rigid foam insualtion board that is actually designed primarily for commercial roofing and sidewall construction. Polyiso is short for polyisocyanurate which uses a chemical structure similar to polyurethane. More specifically, the best polyiso insulation for hexayurt making is the product that includes a thin layer of aluminum foil laminated to one side. This product is focused on uses related to heating, insulation and air conditioning. You can learn more about polyisocyanurate by clicking here.